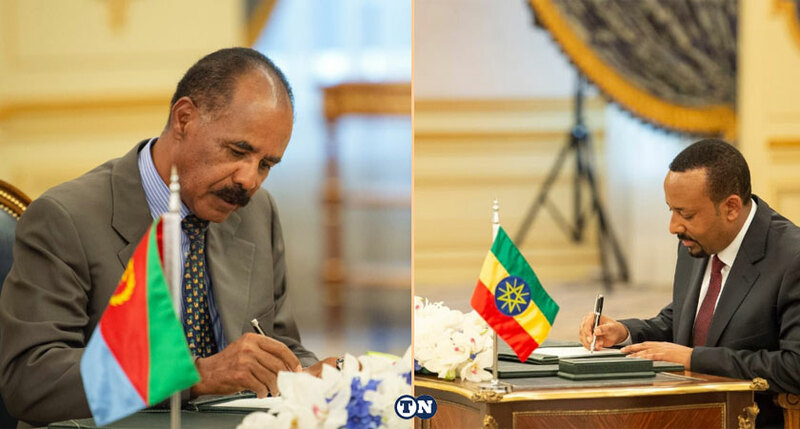 Full text of the Agreement on Peace, Friendship and Comprehensive Cooperation between the Federal Democratic Republic of Ethiopia and the State of Eritrea signed in Jeddah, also known as the Jeddah Peace Agreement. The Seven Article Jeddah Peace Agreement signed between the leaders of Eritrea and Ethiopia on the 16th of September 2018 before King Salman bin Abdul Aziz of the Kingdom of Saudi Arabia, in the presence of UN Secretary-General Antonio Guterres in Jeddah, is, therefore, the Agreement on Peace, Friendship and Comprehensive Cooperation between Eritrea and Ethiopia. The two countries will establish a High-Level Joint Committee, as well as Sub-committees as required, to guide and oversee the implementation of this Agreement. This Agreement is made at Jeddah, Kingdom of Saudi Arabia on this day of September 16, 2018, in two original copies in Amharic, Tigrinya, Arabic and English languages; in case of discrepancy in interpretation, the English version shall prevail.